More news from my new friend at Sunseeker London, Harry Bristow-Holmes, as he tells me of a price reduction on the 24.3m Sunseeker Predator 80 motor yacht OM by a seller who's keen to upgrade. Built in 1998, she had an extensive refit in 2010 and is now ready to go. An interior in cherrywood with cream carpets troughout provides accommodation for six guests in three staterooms while triple MAN engines with Arneson drives power OM to 38 knots. 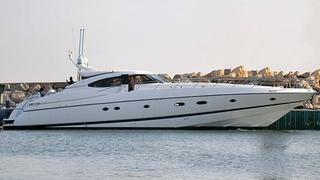 Currently lying in Israel, her asking price is down from $800,000 to $695,000.